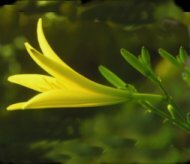 Huang Hua Cai (Hemerocallis citrina Baroni) is cultivated in most provinces of China. Its flowers serve as a vegetable, and its dried buds and roots have medicinal value. 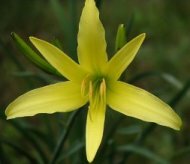 Citron daylily rust is an important disease; it is found in Hubei, Hunan, Shangdong and other provinces. The incidence of diseased leaves is more than 50%, often causing reductions of 10-50% yield. The pathogen (Puccinia hemerocallidis Thuem.) infects leaf, flower and stem, which first can be seen as brown uredia which erupt through the epidermis of leaves and stems. The urediospores are ellipsoid or ovoid, brown, echinulate, 16.8-28.1 x 14-21.1 um, usually 23.4 x 17.6 um. As the season progresses, the uredia are replaced by black telia which often merge to form black long ellipsoid or short streaks. The teliospores are yellow-brown, two-celled, and short stalked, and measure 50.8 x 18.7 um. The pathogen can overwinter as mycelium in or spores on infected plants. For latent infections, urediospores can be produced on the diseased plants in the following year. Urediospores are wind-dispersed and cause repeat infections and epidemics. The role of telia in the disease cycle is not clear. Temperatures between 24-28C (75-82F) with relative humidity about 85% is optimal for disease development. 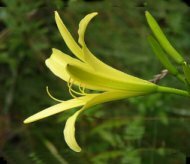 If many daylily plants are grown together in a soil with high water content, the rust develops rapidly. In the Yangtze river region (such as Hubei province ), the rust occurs first in mid-May, developing quickly in June, and becoming epidemic by mid-June. During high temperature weather, the disease development stops. In autumn, rust may damage autumn seedlings again. Control : use disease-resistant cultivars, use suitable cultural methods, destroy plant debris, spray triadimefon or carbendazim. This information is taken from: Zhou Maofan, Bao Difu, Zhao Chunsen et al. (editors). 1998. Atlas of Diseases and Pests of Medicinal Plants in China. Hubei Scientific and Technological Press. Wuhan, Hubei, China. pages 198-199. Translated into English by Dr. Huang Junbin, Huazhong Agricultural University, Wuhan, Hubei, China and reproduced here with permission. Epidermis = a plant's "skin"
Spore = reproductive unit capable of infecting, analagous to a "seed"